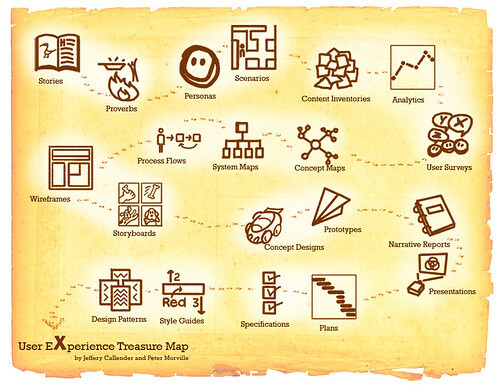 User Experience Treasure Map, originally uploaded by Peter Morville. To get business value from all the work we spend into IA, one needs simple means to communicate as this map. Outstanding questions to this space relates to ‘boundary objects‘ to other architect practices within the IS/IT domain as EA‘s and IT-Architects? Sometimes we share vision, but not world view, hence loads of disconnected conversations. Most of the time still the user looses this battlefield. This entry was posted on Thursday, February 19th, 2009 at 5:33 pm and is filed under Uncategorized. You can follow any responses to this entry through the RSS 2.0 feed. You can leave a response, or trackback from your own site.